Businesses looking to Interact with customers and prospects in real time and then monitor those interactions across the customer journey to gain a complete view of customers. Nextiva Chat allows you to increase revenue, deliver faster service, and boost efficiency. 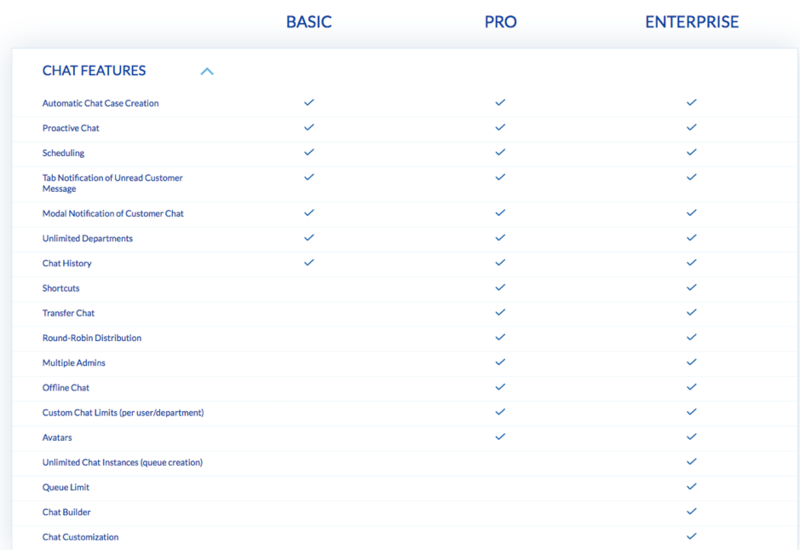 Interact with your customers and prospects proactively with Proactive Chat. You can easily talk to hesitant visitors, initiating a conversation without a click. 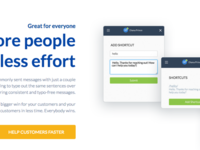 Increase efficiency with chat scheduling, text shortcuts, and unlimited queues. Seamlessly integrate with other Nextiva products for a full view of customers. Pros: We work with Nextiva for a number of their products. We first made the move to their VoIP service and had such a great experience we have since started using many of their other products, including email marketing, cloud storage and a few others. The Nextiva set up works very well for us as we're able to get a service level that we didn't think was possible for a business of our size. It's important to us as we still need a customized set up but don't have the budget for a huge implementation. Nextiva's platform enables us to add on as we need and it has integrated really well with our existing systems and processes. From a training and onboarding standpoint, our team has been able to get up to speed quickly and that means we can realize the benefits of the technology investments fast. Our sales team is especially happy with the mobile app and the ability to work remotely with ease. It's really made a difference to them and their performance. We are very happy with the overall offering and pricing of Nextiva's products and they are a preferred partner because of it. Cons: There was only one time that we had issues with Nextiva and that was due to a staffing issue they had on their side. It was an isolated issue with a new employee who was removed very quickly. We do not believe that this situation was reflective of the company and they were able to remedy very quickly. Overall: Overall I think we can say we are big advocates for the Nextiva software. It's been important to our growth over the last 3 years and they are always developing new products that adequately address problems in many businesses. I appreciate both the quality of their work as well as how they work with their clients. It's a partnership and they are very good at clear communication, clear expectations and fulfilling their side of the agreement. When issues arise, as they can, these are handled quickly and without any major impact to the business. They understand our business and our needs and are working alongside us to improve at all times. It's a great culture, they have great people and the culmination of this has had a positive result for us. 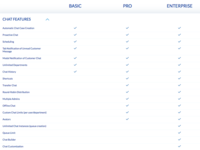 Pros: There are so many pros to Nextiva's platform. We have been able to increase our business productivity, profitability and our communications processes, all with one new system. Nextiva have created an all in one platform that's addressed our major communications issues and there have been a number of flow on benefits that we didn't expect. It was really fast getting set up, our staff were able to learn the tools and get up to speed much quicker than expected. A lot of the implementation work was actually completed by the Nextiva service team, saving our team so much time and energy. Our costs have gone down, which is amazing and completely beyond our expectations. It's really worth checking out. In the sales process we were able to understand and unpack which features we could use all with a simple demo call. It was all a lot easier than we expected. Oh I forgot to mention, we're also using the Nextiva phone service. It's been a while but we still love their VOIP product and the quality of the line from Nextiva is perfect, much better than our old provider. It's worth having a look at if you need to explore phone services and want a more cost effective option without losing all the features and benefits. Cons: I was involved throughout the entire process and I can honestly say there are no cons I think can of. Sorry, that's not exactly helpful but for our business it was just a great fit technology wise. Overall: The overall experience with Nextiva was excellent. I can highly recommend them as a software service provider. The entire process was streamlined and professional. The staff were very knowledgeable and were able to guide the team here through all the necessary steps, they made smart recommendations that allowed us to avoid future problems, and they even made it enjoyable. We're now working on the NextOS system and it's been amazing to see how the team have adapted and how it's impacted their work output. There are many process and procedure benefits to improving customer communication, tracking and projects and NextOS is allowing us to unlock a lot of value we didn't know we could provide. People are happier and customers are noticing the difference. Until recently, I hadn't really recognized just how important tools and systems are to our employees and what a negative environment had arisen as a result of the broken nature of our old services. Now that we're working with the latest in AI and Machine Learning, we are seeing a real shift in the company culture. It's super exciting what this system can do and we're seeing it first-hand. Pros: Nextiva have really made a hard transition much easier. Our systems were way out of date and we needed a high level review and rebuild of our existing coms set up. Not a small feat. The system we had been working with had not been updated for about ten years, at least, and the result was a Frankenstein. We had integrated various tools to drag out the lifespan of the existing system. The Nextiva team were able to come in and assess the situation as well as build a solution that covered all our needs. We were involved in the process and the result was an ideal case, something that we thought wouldn't be possible given timing and budgetary constraints. Nextiva really came to the table with a complete and fitting solution. I can't say how they do it but their team are really well versed in the technology. They understand the issues with making a transition and they're obviously experienced they are able to foresee and offset issues before they come up. They are a full stack solution. I can't recommend them highly enough. Another benefit of Nextiva is they have developed tools that are super easy to learn. This is big for us as we have to invest a lot of time and energy into training our staff on new software and technology.
. When tools are easy to learn and use as a first timer, it saves us a lot of money. We found the team were able to jump into the system, get online and get to work without any interruption at all. Cons: The only con I can really think of is the lack of ability to integrate with some of our older systems. We had some tools we wanted to keep that we had updated only a couple of years ago. Unfortunately, due to their limitations we were unable to keep them as a part of our set up. It's unfortunate as they were expensive and supposed to last for a long time. Plus, training and implementing new tools takes a huge effort so where we didn't think we needed to we would have preferred to keep things the same. However, I think it's a tough call because in our case there was the fundamental VoIP service that needed to be switched out and then all the services that connected onto that had to work too. In some cases, Nextiva was able to integrate but in others we had to launch another solution. I don't think they were unreasonable; it was just a natural downside of large upgrade. Overall: In general, the business has been really happy with the Nextiva system, the final costs, timing and functionality all fit what we asked for upfront. As an older business, we know that this is a rare result and we appreciate that Nextiva was able to honor our requirements and make sure the solution was exactly as we needed it. Technology today is extremely more complex than when our business was founded and there is often a lack of respect for the simplicity, and often antiquated nature of how we did things (and sometimes still do) with Nextiva we felt that our contacts were able to meet us where we were and ensure that we got what we needed without all the time and energy spent on talking about ideals and how it "should be" we don't have that luxury and as a profitable business we don't need to and are unable to work in the same way as younger more dynamic organizations. We still have to service our customers and keep things stable and maintain high quality service. Nextiva was instrumental at improving where we needed to focus, and they did it without interrupting our core business. Our customers will gain from these investments and our business is better set up for continued growth and prosperity in 2019. Pros: When we reached out to Nextiva, we weren't entirely sure what level of solutions we were after. We knew our phone system needed an upgrade as it was very old and starting to get unreliable, but we weren't convinced of the benefits of a CRM system instead of the manual customer service work flows we were using. I felt like the team at Nextiva really took the time to understand our business and help us work out what we really needed. We investigated multiple options and providers, but were really happy with the suggestions that came from Nextiva and felt that out of all of the providers we talked to, their suggestions were the best fit for us and our staff. They had the services we needed, at a price we could afford. We were initially looking at purchasing new phones, but Nextiva suggested hiring them, which was the option we ended up going with. It's cost effective, and easy to upgrade in future if required. It was good that they helped us figure out the best option for us. The CRM system is very logical and our staff have found it relatively easy to learn and use. It's standardized our processes, and has helped our support team become more efficient. There are a lot of great tools within the system which have made their jobs easier, and we're really impressed with the level of reporting we can get without having to perform complicated queries. It's also good to know that there are additional functions we can add on easily later when (or if) our business requires them. Cons: Implementation, while reasonably straightforward, was still quite a lot of work for our business and we underestimated how much effort it would be to get our staff to adapt. We had to train them on how to use new phones (all staff), and (for our customer service team) the new CRM system. There was plenty of support from Nextiva, but our customer service staff found it a struggle to balance the training requirements for the new system against maintaining high service levels for our customers. Some of our staff were quite resistant to change as had worked in our business a long time. We used the 'super user' approach to training; Nextiva trained a few of our staff, who then supported the roll out to the rest of the team. It went well overall, but if we were to do it again, we would probably hire temps to fill the gaps while our staff trained to help with workload management. Our old process and system were mostly manual, and so it was a big learning curve for some of our staff that didn't have great computer skills. Overall: Overall the change went quite smoothly. I was very impressed with Nextiva's customer service from when we first began to talk to them, through to the support team we are using for question now we are using the software. All of the staff we have dealt with were professional, friendly and helpful. I think it's the level of service that differentiates Nextiva from other service providers with similar products. We had a few teething issues with our staff as they were learning how to use the system, but we got through all the training and have been really pleased with the features of the CRM. There are a lot of features that have had a really positive impact on our staff, and now that they are comfortable with the change and the software, their feedback has been really positive. The internal wiki in particular has really helped with increasing staff knowledge and prompting them when they are helping a customer, and the internal chat is a tool that we didn't know we needed - much easier for our staff to communicate while they are talking to customers. We used to be put customers on hold if we needed to get input from other staff members, so it's a lot better experience for our customers now. Once we went live with the new systems, Nextiva have continued to be responsive and helpful. Pros: The benefits of working with a company like Nextiva are really endless. First of all, they have great solutions for business communications and management tools. They are well crafted to address problems and they've been honed over many years and with many clients. The experience this organization has is baked into everything and that means the service is amazing too. They can see a problem and solve it before you're even aware. It's really amazing to see how they work. The team we work with has an intimate understand of our businesses specific needs and can proactively offer ideas and options for tools we may need in future. We're not guessing and shooting in the dark anymore. Our technology roadmap has a solid foundation and a clear future. There are some newer tools, like the NextOS platform, that will be even more amazing than some of their originals like VoIP. With the NextOS platform, they have looked at their clients and what their needs are and developed something that's truly cutting-edge. Making AI and Machine Learning available to small-medium sized businesses is something they can really be proud of and it's going to have so many positive outcomes. It's so much more than a CRM and it touches the entire business from frontline workers, to analysts and project managers, all the way up to the CEO. Cons: This technology is quite demanding on a business. It calls for visionaries and trailblazers to envision how it could benefit, and then they must spearhead the work. Once live, the tools push for efficiencies and the transparent reporting makes it clear if there are people who are not pulling their weight. This can result in lots of organizational change. It's important to understand how to handle this sort of information and enable your organization to adapt in the best way. Otherwise, I can imagine, there could be some negative outcomes too or at least unexpected one. Essentially, those that don't like efficient and productive systems will not enjoy the way these tools change the business. It's as simple as that. They also make the whole go-live process very streamlined and simple. You're not left to work out how to launch like with some technology services. With Nextiva, they're there with you every single step of the way. They do everything in their power to make it a successful experience. We did a project with another company a year or so ago and we realized we were used to the amazing Nextiva service which it turns out is actually quite rare. Really we just need Nextiva to be providing all our software! At least that's my solution to the problem! Overall: We've been Nextiva customers for at least 5 years. It's been a long road with them and we were one of the early adopters. A lot of what could be classed as "negative" I think in hindsight was due to the rate of growth and common young business realities. However, we stayed with Nextiva due to the service. The staff are trained well and encouraged to support clients to the best of their ability. They give the resources required to do a good job, which is really costly but so important. As they grew this part didn't change, they've been able to maintain their amazing service model for many years. As they have released new products into the market they've given us demos and previews and asked for feedback, which we are happy to provide. It's very obvious that they're trying to build the right technology and want to make sure it's addressing the core of a problem. They're obsessed and it makes their products the best on the market. This is why we are always open to trying each new product. There is always something to learn and we don't know how it could positively impact us. Once you partner with Nextiva you get the impression you're being brought into something much bigger and it's really exciting, and fun too. Pros: 1. What a difference a new system can make on your business. Now, phone calls are going to the right individual in their department. Before using a VoIP service, our whole system was a mess. We had no department structure regarding calls, and they were being answered by the closest person to the main phone in their department. The quality of the service is great, too. Every call has been crystal clear, and no dropped calls. 2.) Easy to use for our company. We have several employees that range from their mid-20s to 50s. After a week of using the NextOs; they all understand how to use the phone, and the app. The app has added a new communication layer for our business. It's gave all our employees the ability to chat with each other on the app and eliminated the need to text on a personal cell phone. 3.) So far if we have any questions, we have a support representative that we can email or call with any questions. The whole concept of a VoIP phone system can be intimating, but the on-boarding process made it a lot smoother and easy for our IT department. 4.) A neat feature that we just started to use is Nextiva Analytics. It provides you with all the data that you need to analyze your calls. You can see the various data regarding your calls and do business adjustments. It's like a top overview of your call data. Cons: What we liked least about using Nextiva is the onboarding process took a bit longer than we expected. We had a delay porting our numbers to Nextiva. Beside this small headache, we have had smooth sailing. Pros: Support is amazing! Everyone is friendly, helpful, there's no transferring around or long hold times. I have yet to have a bad support experience with Nextiva. Overall: Straight up, I partnered with Nextiva as I was looking for a good offering to bring to my clients who were unhappy with other local providers, most commonly Comcast's "Business Voice Edge" hosted VoIP service. I was introduced to Nextiva and have always been leary of hosted VoIP that doesn't come from the carrier you're getting Internet via. When you're on VoIP with your Internet carrier, there is usually a Quality of Service (QoS) type of system put on your connection that ensures general Internet traffic will not drown out your voice calls. This way you can blast Netflix all you want, the voice calls still go in and out first. Suffice it to say, I have yet to encounter major problems with voice quality and bandwidth issues. Support is amazing. The person that answers your call is the person that's going to resolve your issue. Right then. No callbacks. They are knowledgeable and friendly, and if they happen to not know an answer right off the bat then you get muted very briefly while they check in with someone more familiar about your specific scenario. Their onboarding process is simple, yet thorough. If your phone call flow scenario is complicated, they're going to fine tune that with you to ensure your calls are directed in the manner they need to be. They also began offering phone rentals this year, which I'll be honest more clients have asked for versus purchasing units. Rental offerings are cost effective and offer you much better warranty terms. Cutting edge technology is here! Comments: We're seeing double digit growth on last year's numbers. Without sounding too over the top, this system is pretty amazing. It's definitely helping us manage our team and understand the importance of key metrics and driving positive behaviors. The dashboards are great training tools and managing a large team we have to be on top of everything or it can get out of control fast. 2019 will be a record breaking year if we keep going the way we are. It's exciting times and it's great to know we have a system that's actually helping us achieve our goals. Pros: We were so happy when we found Nextiva. They offer a service and products that really solve our key problems. We struggle with keeping our team on task and motivated, it's a communication thing. We need to be able to put the goals and tasks up and track everyone towards the company targets. It's hard with a large team and lots of different personalities and levels of experience. With our new Analytics platform, we can share how things are tracking and it's keeping the team really focused and on task. We love it and the results are pretty amazing too. Cons: We had to do a lot of work to determine which were the correct metrics to drive the right behaviors. We were warned it's easy to just say one thing is "the goal" but then people don't always behave well. You have to achieve the goal the right way too, or you could hurt the brand and the business long term. With our business being second hand car sales, we already have a challenging reputation. We got there in the end but it took some time to work out how to frame the numbers to get the team working together. A win-win for staff and customers! Pros: The Nextiva NextOS platform is helping our staff do their jobs better, and in less time. Within our Data team the reporting processes that use to take up 2-3 days of the week are now a couple of hour's work. On the sales team side of things, the team are converting sales at a higher than average rate. On the customer side, the wait times are down and customer sentiment is improving. This is all in one single system. It's pretty incredible. Cons: I don't know if I'm aware of any downsides of this platform. I guess if you didn't want to know all the ins and outs of your business, then you wouldn't want to have the transparency and information that this platform generates. Also, it's a big job determining how to implement if you're transitioning off other systems onto this one. You do have to invest in it to ensure you make the most of the capabilities. In our case we believe it to be a solid decision to set us up for the future. Overall: The product offering is really compelling as it's got the capabilities for enterprise level businesses without the cost and complexity of implementation. The service and support is also excellent and Nextiva are clearly invested in ensuring the success of their customers. Overall we've been very impressed with the work to date and the results too. It's also a huge peace of mind thing for the board of directors as we have had to change a lot of systems over the last 5 years and that was a hugely time and money intensive effort. With Nextiva, it seems we've finally got what we need for both todays needs and the future needs we expect in the coming years. I would highly recommend Nextiva to other medium sized businesses who are looking for an all in one coms solution. Pros: The best part about the Nextiva software suite, is that is really does have a solution for everything, and they all work together. Our staff really appreciate using one system, that has replaced 3-4 old systems that we were using. It's a lot easier now to onboard someone, and from a management perspective, we get a lot higher quality of data and reporting out of the Nextiva system, compared to our old systems. We found it easy to train our teams and ramp them up, a lot of it is quite user intuitive, and Nextiva obviously have a lot of experience in rolling out to medium size organizations. We followed their guidelines, and our teams were comfortable reasonably quickly. Cons: Because Nextiva was replacing multiple systems, there was a fair amount of due diligence to be done to ensure there were no gaps in terms of how we use the system, and then again in terms of making sure the customer transition was smooth. We also had to update a lot of our Standard Operating Procedures to ensure everything was documented correctly and that we would be able to easily onboard new staff. In saying that, we found Nextiva really supportive and they offered a lot of helpful advice throughout this process. Overall: Make sure you take the time at the start to ensure that both you and Nextiva are on the same page and understand the requirements. You won't regret doing the extra work upfront, and it will make your job a lot easier at the other end. Otherwise, it's a great system and we're very happy with how it's performing for us and how the team seems to be adopting it. Pros: Nextiva have really delivered a total single platform communication system - NextOS is a great product, that delivers on all fronts. We were running multiple systems and everyone needed two monitors and lots of tabs open in order to follow all our processes and capture the same information across multiple systems. We had tried to make it more efficient and streamline as much as possible, but when you are using multiple tools there's only so much you can do. We always thought that was just the way it had to be, but once we found NextOS we realized we could simplify the entire business by moving to a single platform for all our business communications. Having everything on one platform has increased our data quality and the quality of the reporting, while also reducing the time taken to create those reports. It gives us a lot better view of our customers, what they are wanting, and the sentiment analysis is really beneficial. It's saved all of our staff a lot of time, and new starters to our business always comment that it's so much easier having one system that does everything compared to their other workplaces. We were impressed with Nextiva's approach to training and followed their recommendations and we were pleased with how that went. It was a big change for our business but their high level of support really helped smooth out the process. Cons: It's a big change for staff when you are implementing a new system that they will be using for 95% of their work day. It replaced a lot of other systems, so the business change was significant. Overall: We have been very impressed with how much Nextiva thought of when they were creating NextOS, and are looking forward to seeing what other features are rolled out in the future that we may find useful. Pros: VOIP phone system was the best idea we had for phones. Nextiva has made it easy to remain a long term customer. Our office is phone dependent and if a client cannot reach us they let us hear about it. Nextiva has handled problem we have experienced with the urgency that I would expect from a professional service company. Most questions are answered before we get off the phone. The recommendations for phones was spot on. The service is reliable and the quality of sound it clear. My client never ask about the kind of phone we are using. They can't tell the difference. The billing is always correct and predictable. Never had a billing problem. Cons: The app is a bit uncomfortable to use. In order to answer the phone I have to press a couple of keys and often the phone rings 3 -5 times before I answer. I prefer our calls answered in 2-3 rings. Now this is only a problem when out of the office and the phones are forwarded. Pros: Hands down it has to be the customer service and the features. The customer service is outstanding and they have a team of technicians that understand the ins and outs of the products as well really care about your own personal success. Have always had a pleasant experience when working with the support guys. The features are very simple to use and are extremely useful. The combo of these two has really provided us a great overall experience. Cons: The only con was a small issue with our set up process. There was a miscommunication between the Nextiva sales rep and the support technician which caused a delay in our phone set up. However, once the issue was identified it was resolved relatively quickly. Overall: Extremely helpful support from Nextiva. I have to say it is one of the only companies I have worked with where calling the helpline isn't a painful experience. Every time I have called in I have reached someone within 5 minutes. The same goes for emailing in any questions. The response time is almost immediate. It has been 10/10 experience each time and the reps I have worked with have been some of the nicest customer support people I have ever spoken with. Their knowledge of the software and hardware, inside and out is very comforting and each time it strengthens my confidence in Nextiva as our provider. The overall service is very user friendly and very easy to manage. The features are as they say, brilliantly simple and really generate a big impact for our company. Especially, the auto attendant and call forwarding features which are excellent. Nextiva always seem to be making improvements to their service and coming out with new stuff each year, so we are very much looking forward to what is in store in the future. Keep up the great service Nextiva. Recommendations to other buyers: Excellent value for the price. Would really recommend giving these guys a shot. Pros: Nextiva's customer service is extraordinary. It is the best thing about the company. When you have a question, need to add/drop services, need to change billing info -- anything --- they are immediately responsive and after years of doing business with Nextiva I think I can safely say that their employees are crazy happy - from tech support to accounting to customer service! I have used several VoIP providers, for onshore and offshore dialing, and Nextiva has the most consistent high quality of calls at the best dollar value. Combined with their service, there is no other company that equals them! Cons: Nextiva could use an update on their call center user interface. It is outdated but that does not diminish the great features and usability. Overall: Nextiva is a great value and they offer tremendous customer support. Pros: Nextiva has some very sophisticated tools for businesses. They make smart solutions that are simple to use but high complex in the background. Its what technology should be. I'm not a tech guy so I don't need it to be more difficult than it already is. These tools work very well for us. Cons: I can't think of anything negative. They did what was promised! Overall: The experience with Nextiva is very polished. They have clearly got a lot of experience in their field and they have fine-tuned things to ensure a great process for their clients. We couldn't fault them on anything. The team they have working on our project is a bunch of really nice people, who are also amazingly talented and very "up on the tech" which we really benefitted from. They are clearly very engaged and want to make the launch a success. We felt like we got a service that was well above expectations. For the service alone I would recommend checking out Nextiva. We don't have a huge IT team so it's really a big win if the heavy lifting in terms of the work load is handled by the vendor. In this case Nextiva handled everything for us and not only that the response has been great too. We're very happy. Cons: It took some training for our employees to understand how to use our new business communication system properly. This should be a common notion within all companies that switch to a VoIP service. Pros: We have a few family businesses and we use Nextiva services for all of them. The great thing for us is they can work for our small and larger enterprises. The packages make sense regardless of the business scale. They also make it easy to work with them so making the switch is super simple and they support you the whole way through. You don't have to be super tech savvy to get this system up and running. It's easy even for me. Cons: I don't think there are any. At least none I'm aware of. I am a big fan! Overall: Like I've already said, I'm a big fan. Nextiva makes flexible and smart tools, they're doing the right thing by businesses and not just selling them an idea. I've worked with various platforms and sometimes it's like you're just being over sold when it's not something that your organization actually needs. Our contact is very honest with us and only presents solutions that actually would make sense to our business. We appreciate that we're not just another dollar sign to him. Our ROI on the systems we have is really high. I don't have any regrets; these are great systems for all our businesses. Comments: Nextiva VoIP is a huge improvement on our old system and has enabled us to better communicate internally and externally as an organization. Once we have adapted our team to the system more, training etc. then we will see even more benefits. It's just the beginning for us! Pros: Nextiva VoIP has a great offering that's affordable and flexible for various types of businesses, we have seen great success with their VoIP platform and the team really enjoys all the features and capabilities they now have. Cons: Prepare for change with this system. We are experiencing some pains from implementation as it's brought to light a lot of process and team challenges we were not previously aware of. We now need to deal with these issues. Pros: The customer service is outstanding. They are attentive, patient, and very friendly. The service has worked great and we are very happy with everything. Cons: Only hiccup was with our auto-attendant, however, it was fixed in a short period of time. Overall: We were having issues with our auto-attendant. For whatever reason the dial numbers and lines were not connected properly and so customers were being directed to the incorrect lines. This had been going on for a few days before we realized it. Called into the support department and was able to reach someone right away. I spoke with a gentleman named Chris. He was very good-mannered and showed me how I was able to make the changes myself. The issue was fixed quickly and our auto-attendant was working perfectly and has been since our call. I had a few other questions for Chris and he was very patient and nice about answering all of them. He also gave me some extra tips on how to manage our network. It is always nice to know that you have a real person on the other end of the phone that can assist with anything you need. Needless to say, it was overall a great customer service experience. Recommendations to other buyers: This company definitely takes care of its customers. Comments: It is with much disappointment and regret that I write today regarding my recent experience with Nextiva and its employees. It was, without a doubt, one of the most personally frustrating and financially damaging experiences I have had to experience in my years of communications with a service provider of any kind. I am a business owner who depends greatly upon the ability and ease for my customers to contact me for products or services. Without the communication of both our established and also potential clients, I wouldn't be in business to this day. I find it most imperative that in order to keep my clients, I must carry my business in a way that is integrous and honest, and it was to my ultimate disappointment that Nextiva's employees did not share the same values. As my business grew, I found myself in need of a phone service that offered more than my mobile service provider did, so I began looking for internet phone providers that could accommodate my needs. It was in March of 2018 that I committed to finding a resolution to the need, and also when I initially contacted Nextiva for service. My business and its employees rely solely on communication by mobile devices, and it was our understanding upon several conversations with Nextiva's sales department that Nextiva would allow me to continue to use my mobile device while utilizing their features for my business (IE Call Forwarding, Call Transfer, Conference Calling, etc). Through multiple conversations with Nextiva Sales and even Nextiva Management, I made it very clear that I used a Straight Talk mobile device powered by Straight Talk wireless service, and I was assured that Nextiva's service and features would work perfectly well on my device, and that there would be absolutely no issues porting, but rather a reliable and smooth transition and zero loss of connection at any time. After many issues, failed port-in attempts, and multiple service disconnections, we discovered that Nextiva does not work with a Straight Talk mobile device. This distressing sequence of events resulted in a devastating loss of profit for my business while we experienced multiple shut downs of our only business line of communication. In fact, we believe to be the first customer of theirs to attempt use of their service with a Straight Talk device, as it became clear that they were not even aware that the type of device would not work with their service, further proving that they had not ever tested using this type of device. It is unfortunate that Nextiva advertises that their service will "work with any provider on any device" as it is blatantly untrue and false advertisement. It took two separate instances of "mobile phone disconnections" and troubleshooting with Nextiva's technical support team to conclude the prior stated. Not only did Nextiva's service require that we go through three port-in attempts, but our mobile services (and therefore business calls) were disconnected twice over several hours before Nextiva's team could conclude the reason why. After several days and hours on the phone spent with Nextiva's team and realizing that their service would not work for our needs, the porting team then ported-out our main business line without our authorization or knowledge. In fact, we didn't have any idea that Nextiva's porting department ported out our number for nearly an entire week and were not able to retrieve the number for 8 days after it was brought to our attention that it was ported out unauthorized - we only found out because we received an email from a customer asking for a "working phone number" that they could reach us at. You can imagine the kind of frustration this caused on our end to realize that the reason we weren't receiving business was because of something Nextiva's employees took upon themselves to do without our authorization, let alone our knowledge. Upon requesting that our service be cancelled prior to the unauthorized port out, it was made clear to more than one person that we could not port out our number until we had a new service provider to port out to. Support team members of Nextiva supposedly understood this by promising not to shut our service off until we found a new service provider, yet ported the number out anyway, leaving us to chase it down on our personal time outside of Nextiva in an effort to regain control of it. This year our profit margin had been slowly rising higher until we had no phone or open line of communication with our customers. During the month that we spent attempting use of Nextiva's service unsuccessfully with our multiple port in attempts and disconnects, our profit margin dropped 96%. I can't begin to place a value on the amount of business that I have lost by not having an open business line for my customers to reach me at. I have hundreds of loyal clients of over 6 years that were unable to reach me (and at this point may believe I'm no longer in business), several sales that I was in the middle of that I was never able to complete, and several websites and advertising avenues with business line listed, that appeared fraudulent to (who knows how many) potential clients searching for services from my business as well. It is unknown if I'll be able to recoup all of them back, and unfortunately, there is no way that I'll ever know. I can state for certain that I did not receive business phone calls for anywhere between 1-2 weeks combined due to the incompetency and many mistakes of Nextiva's employees that we experienced during our attempts to use their service. We were billed for two months of service that we did not use and spent hours of both our personal and our business time in attempts to resolve any and all issues with their team, ultimately, to no avail. It was discussed with both Nextiva's porting department as well as their retention team the multiple issues that contributed to our needing to cancel, and we were assured that because we were unable to use their service as expected, that we would be refunded the full amount of our costs. We signed up for a 30-day trial (or money back guarantee) but because of the multiple failed ports, we missed our window to cancel (to no fault of our own). Not only were we assured that our payments would be refunded due to our extensive issues, but we were then lied to on the phone during our final disconnect of service by an employee whop stated that Nextiva would never have promised us a refund, and that we should not expect one. I am a business owner that is undoubtedly frustrated and beyond upset over the financial damages and los that we experienced during our time attempting use of Nextiva's services. I wouldn't recommend that anyone spend a moment of their time speaking to their team. It was most devastating to learn that I couldn't trust the words coming out of their mouths at any given time, as they have mastered the art of saying exactly what it is that their consumer wants to hear. 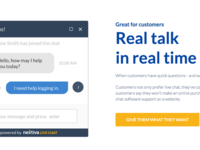 Perhaps this may be a service that works better for landline users (though that is stated with only the utmost assumption), but if that is the only case, then Nextiva needs to stop selling their service as a solution for mobile phone users as well. Pros: Nothing. This product was absolutely horrible - but the customer service was even worse. Customer Service and Tech Support know very little about what they are selling. See full review below. Cons: customer service, technical support, customer relations. All of their team does not work together and none of them know what they're talking about. Their service states that it will work with ANY DEVICE, and it is NOT TRUE. Pros: The team at Nextiva provides amazing service. We like working with them on releases as they're so good at what they do. They really understand the ins and outs of the technology and how best to implement it for different types of businesses. Cons: None. We benefited a lot from this knowledge throughout the process to go live. We now have VoIP and their CRM platform in place and they work together beautifully. It really pays off to have more than one system with them as they are designed to work in unison. The cost-savings are great too. Overall: Nextiva have created great technology and their organization has been set up to support it well. They're helping businesses like ours be better, connect with clients, understand complex customers and drive revenue and growth. It's not an easy task and yet they engage with it and work through the challenges of each business. I really respect the people we work with on the Nextiva side and they make it a delight to do business together. They are our preferred software vendor, if they make it we'll be considering it! Comments: Great service team, excellent product and the installation was a breeze. Pros: We are a fast growing business so our needs are always changing. Nextiva, has given us a service that will easily grow with us. We knew we needed voip and could not spend a huge amount. Nextiva created a package that fit exactly what we needed at the time, but does still allow for flexibility in the future. It has been a huge win for the end users here in the office, they are enjoying all of the new features and finding a lot of efficiencies as a result of the technology. Cons: None to date. We have the system that will work for us for the unforeseeable future and at the price we wanted. I'm sure there will be something that comes up in future but we've only been live for a few weeks so hard to be specific here. Comments: let's see, generally I would say we're very pleased with the response from our customers since adding chat. The tool is easy to use and it's getting a lot of use from high value customers. I would class it as a conversion tool as many of them do go ahead and purchase after the interaction. We will see how this impacts our sales overall in the coming months. At this stage all signs are positive. Pros: Our customers love the new chat feature we have in place. It's brought us a lot more customer contacts and it's super engaging. Our CSR's are happy to be scheduled on chat too, which is an added bonus. It's great for service levels as they can manage more than one chat at a time too. 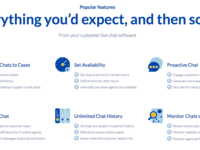 Cons: There are cheaper chat tools in the market but we prefer to use a higher quality service to ensure the best experience for our customers. It's just better for everyone that way. Pros: Our team has really taken to NextOS, they have a lot more capabilities than compared to our old system and they've dived right in! It's been great to see them figure out how to integrate the tool and make the most of the new functionality. We are very excited to see how this impacts our results in the coming weeks and months. Cons: This is not a cheap tool. It's probably a good idea to understand what your goals are first so that you're not investing too much. I can imagine you need to have a certain scale of business first before this system really becomes useful. Overall: The set up time is pretty intensive. You do need to think through how best to implement and make sure it's going to achieve your goals and be right for your organization. It's well worth the effort but it's not a plug and play system it needs to be configured right. If you do take this time, which we did, then it's immediately impactful. I believe the improved communication, clear goals and metrics are going to help us a lot. Comments: Consider investment in more self-training materials for NextOS to aid in the onboarding process. Pros: We were concerned about the call quality and ramping up of new team members. Neither of these things have been a problem. We've had no reported incidences of dropping calls, or static lines. Cons: Onboarding is a challenge as some team members are adopting more easily than others. We needed some to get more training and others are running miles ahead of the rest. This could be solved by some more training materials so we could get ahead of the issues of different degrees of technology comfort. Pros: NextOS has unlocked all of this growth potential and efficiency we didn't know was possible with our small team. It's amazing and with the AI and machine learning we are not doing the heavy lifting; they bring insights to us. It's amazing. Cons: It's creating work for our team, action items, and not everyone likes this. It's a game changer which means you need to be able to handle the team members that don't like change. A change management training module would help. Overall: It's been about growth and maximizing from the beginning for us. Our worst fear is that there is more we could be doing and this tool unlocks those opportunities and delivers those insights to us immediately. Then, the team can action them. It's fast, and effective. If you need to level up this is the tool that can help. Comments: This system has allowed us to focus on what we do best, we can service our customers, grow and respond fast without any trouble. It's been a big improvement on old system. Pros: We have a fast growing team and the Nextiva system has been great for us as it's allowed us to scale up without interruption. It's our central hub of information and makes it simple for new employees to get up to speed and start to contribute to the team quickly. Cons: None as far as we're concerned. It's a great system. Nextiva's helpful reps always walk us through the steps to set up using their intuitive software. Pros: Generally the system is very affordable, straightforward, and easy to use. It is pretty much what you would expect and provides the basic features you need. Very few issues with the product. Cons: I would like to see more supporting documentation or easily accessible training for basic functions. Maybe this was available but just not made available to me by the folks in my office. Overall: Nextiva lets us communicate effectively at an affordable price. I like how voice mails are captured on your PC and you can archive or play those back. In general I would recommend the system. Comments: After 18 months, I still am learning new features. Robust software that isn't the simplest to use but has everything one could want. Pros: Always up service! We've had some very minor interruptions, but the few we've had always cleared in a few hours. Moved our fax to a VOIP system and compounded our savings. Great app for remote work. Cons: The interface is much more difficult to use than with some of the other providers we've worked with. A few items require support to make changes on the back end as there are features that local administrators should be able to do. Call reporting is very robust, and a little too robust with a call group (each incoming call shows on EVERY extension that rings, not just the one that answered). Pros: Top quality product. A++ Very easy to use user portals and back-end admin software. Doesn't require you to be a communications expert or engineer to figure it out. AND, whatever you can't figure out, their amazing Enterprise Support staff can...and they do so rather quickly. They are truly amazing. A++ customer service, very knowledgeable ' available support staff. Our Account Rep is extremely professional, friendly, attentive and responsive. When switching from 8x8 to Nextiva, we did some pretty extensive software and service comparison testing against much larger companies that supposedly offer "high tech solutions", and "superior service" and Nextiva has come out on top each and every time. I seriously love this company and their products. Overall: Increased visibility or work requests, improved efficiency, etc. Pros: The real time file edits have been great for our team, as we can be on a call from different locations and all be looking at the same file, as it is being updated, in real time. Cons: It took some time to move to the switch from working off desktop versions, to have everything saved on the cloud. Overall: A lot of our staff are wanting to work flexibly, and we want to support our staff to do this. One of the problems we initially had to overcome, is that we tend to work quite collaboratively when we are all in the office, and sit in a room with something on a screen. We were unsure how to replicate that when everyone was in different locations, but the real time updates mean we can still do this. We haven't had any issues with lags, which is the problem we had when we were doing a lot of screen sharing to get work done. It's also been good to have a centralised location where everyone can access, regardless of where they are. Makes us wonder how we did it before!! Pros: Our team had been struggling with the old system for a while and now we're with Nextiva we're really well set up for the coming years. Not only that, we are also saving money! Cons: Our set up was quite a complicated ordeal and it took a while for us to understand and then plan out what we needed. However, the Nextiva team were very helpful and worked through requirements with us so that was amazing. Overall: The Nextiva team were amazing to work with, they made sure we had just the system we needed, they took us through requirements, implementation and training to ensure we had what we needed. The team has been able to hit the ground running and we're already seeing loads of positive outcomes. It's a big turnaround from our old system. Pros: We've been using the Nextiva phones in our business for over 8 years. Very easy and simple to use. - transfer, add calls and conference calling is very easy to do. Cons: If internet goes down - so does the phone. It will get transferred to voice mail which then in turn can be sent via email. Comments: We are really very happy with the Nextiva VoIP system. It's making life easier for our staff and saves us money on more administration. It's a smarter way to manage our communications and it's going to help us grow too. Pros: We use VoIP from Nextiva as it helps us manage call volume with a small staff. The features are really smart and make it simple to divert calls, manage messages and keep things flowing smoothly. Cons: It's a great system and serves us well. Our entire office is happy. And I couldn't be any happier we see lots of value. Comments: NextOS is certainly going to give us a competitive edge. We're using AI and machine learning to optimize many of our processes. I know for a fact that our competition isn't using tools this sophisticated. Pros: We are really impressed with the sophistication of the NextOS product. It's really futuristic and offers features we didn't thing would be possible for us to access for many years. Cons: It's worth the money. We really see the value for our business. I'm impressed and really excited for the future. Comments: I would highly recommend considering Nextiva-both for VoIP and NextOS. They have solid systems, good support and they make it easy. They know the challenges of a business and they work to address those. They make it easy to say yes and we're very happy we did. Pros: this was the best decision we made all year. NextOS is a huge advantage creator for us. We're going to smash the competition over the next 18 months as we have so much more data and insights to inform our work. Cons: Nothing I can think say right now. The technology is amazing, the staff are helpful and knowledgeable. We're live and the team are trained and starting to utilize the tools. It's a dream roll out! Nextiva puts customer insights on our hands. 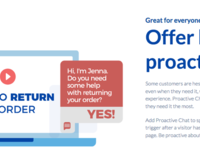 Pros: I like the quality of support provided my team by the Nextiva customer support department.Of note,There are support representatives who always seem to be the ones I get across to ,anytime I have got a complaint and my concerns get resolved promptly. Nextiva offers the best deals for VoIP services I have come across in the past one year.With Nextiva,we are provided with all functionalities and feature we need to communicate seamlessly with our clients and track their journey. Cons: I absolutely love Nextiva.I have had no bad experience using it. Overall: Nextiva makes it possible for our customers and partners to give us feedback on the quality of service we provide them.Therefore letting my organization stay in-tune with their yearnings and thoughts,leading to an improved business insight process. Pros: Call quality, very comprehensive back end that you can work on without customer support, auto attendants, call blocking, call flows and routes, ability to upload own recordings for call menus and announcements. Cons: Lack of integration with products, need to be able to have incoming calls run a caller ID check on my database and also whitepages so I have more information when calls come in. Zero integration support. Cons: Occasionally the calls have a poor connection and a lot of the functions are unnecessarily complicated to setup. The customer service is nice and patient but they don't always know how to fix a problem and sometimes make it worse or tell you things that are wrong. The future of business administration! Pros: This system is a step into the future. It has really improved the internal systems of our business. This streamlining saves us money and time every single day. We would highly recommend this system to businesses across many industries. Cons: Putting this system in place forced a lot of other changes across our system. This was a challenging part of the process. Overall: The experience working with Nextiva was flawless from start to finish. We were pleasantly surprised by the team and how quickly everything went. Even now, whenever problems or questions come up the support people are always very helpful and quickly resolve any issues. Seamless communication that allows great customer service! Pros: With Nextiva, you can enjoy calls through smooth service. With each plan, you can choose what features will satisfy your business needs. Cons: With premium features, the costs rise up significantly, every business needs to cut down costs and telephone bills have a good chunk to pay for every month. Hoping they would offer discounts to the longer you have been availing their service. Comments: If you are looking for a VoIP company, go to Nextiva! You wont regret it. Pros: Amazing Customer Service Top Notch Customer Support Best Sales Team Phone systems with no static on the lines Easy to reach customer support- online chat and by phone Easy setup and install They walk you through the process every step of the way I wish that other companies had the same business ethics and customer support as these guys do. Overall: We used ringcentral before switching to Nextiva. Nextiva is far superior and the better solution. We made a mistake signing up with ringcentral but then immediately switched to Nextiva after a month of nightmares with ringcentral. Terrific platform for VOIP and terrific customer service to match. Pros: The thing about Nextiva is, I rarely have problems with their systems. When I do, support is very easy, and quick to rectify the situation. Our account manager is very attention and checks in on us often. He also tries to get us the best deals he can on orders like new phones. Speaking of phones, Nextiva phones are very easy to setup. Their vFax system is a terrific improvement over the old way of doing it. Cons: The portal can be buggy sometimes, but that is usually cleared up quickly with a phone call to support or our account manager. Comments: This tool is really helping us improve our service level with our customer base. We expect to exceed our goals this year as a result, and early signs are positive. Pros: Nextiva is the ideal system for our business as we're working on being more and more customer centric. This tool enables us to do that really well, it's intuitive and unlocks the capability of our team members. Cons: There is a lot of training and onboarding involved with using this tool. It will take some time to get set up and this can create some chaos. The end result is worth it but it will need some time and attention. Pros: The Nextiva CRM is making life much easier for our analysts. They are able to query the database without any technical support. It's much more graphical and friendly which means they save time when developing reporting and presentations for senior leadership. It's really just streamlined this whole side of the business. Cons: There are very few downsides to technology that makes things more efficient nothing really comes to mind. Overall: We found the entire process with Nextiva to be very effective and they fit well with the ethos of our organization, which is always to be customer centric. We felt they listened well and took care of all our concerns. I think they have a solid business model and I expect they'll continue to excel in this arena for years to come. Pros: NextOS is an amazing system. Combining your CRM, work flows, insights and resource management in one place. We use it every single day and believe it is giving us an advantage over our competitors. Cons: We have been challenged in a number of areas of the business to act on the insights we have gained. In the long term this will result in a beneficial outcome however in the short term it can be quite divisive and this can create some internal tension. Overall: Sign-up and onboarding was a breeze. We were using the system quickly and are already enjoying the benefits. Comments: The process with Nextiva is so smooth. We were really impressed with the way they managed the process with us. There are so many pieces to the system and they are the experts who can really guide the implementation. The service they provide is a huge benefit. Pros: We've been with a couple of VoIP service providers and it's been a headache of a process. We found Nextiva VoIP to be the best option for us as it has everything we need at a good price. Cons: Nothing comes to mind right now as I am writing this. All is going smoothly with Nextiva there call performance is what I wanted. Best CRM we've ever worked on! Comments: We were in desperate need of a new CRM. NextOS was the winner in the end with the best functionality on offer at the best price. The set up was and involved process to make sure it was working as we intended it to. The Nextiva team was very good at getting us the information we needed and they made it go pretty smoothly. Pros: We are getting amazing insights and data on our customers. All actionable and all in a timely manner. We're smarter than we've even been. It's amazing technology and it's what we've needed in a CRM for a while now that no one else was offering. Cons: It's a big job to understand the tool and get it working. It's a good idea to assign a person to own the process and give them the time to learn and understand it. Pros: - Ability to receive voice messages via email. This ability gives us the flexibility for all voice messages to be forward to all our of employees, and allows for a quicker response. - By using Nextiva makes our small business seem like a huge professional operation. Cons: The process to setup our VoIP line was longer than I expected, but it is the norm for a VoIP Provider. Overall: Main benefit has been the ability to use our business phone on the go via the business app.